Chef Paul Bocuse's powerful personality expressed itself in his Lyon-area restaurant's eye-catching exterior. I'm wearing my Paul Bocuse tie today, in honor of the great French chef, who died Jan. 20 at the age of 91. Bocuse himself gave me the tie, after I finished a meal at his restaurant, just outside Lyon, in 1996. I protested that Wine Spectator policies didn't allow me to accept gifts. "Bof!" he said, tucking it into my pocket. I was on a mission at the time: eat in every Michelin three-star restaurant in France and report the results for Wine Spectator. It was an amazing (and grueling) three weeks of indulgence and education. Every restaurant was different, each with its own personality. No restaurant had more personality than Bocuse. It began with the building itself, a neon-lit, gaudily colored building with "Paul Bocuse" in huge letters perched on the roof. The luxurious interior was decorated with photos of the chef with the great figures of his time, politicians and film stars. Bocuse had a big ego and irresistible energy; there's good reason, beyond his extraordinary culinary skills, that he became "the most celebrated French chef of the postwar era," according to his obituary in the New York Times. I won't recapitulate Bocuse's extraordinary career; there are plenty of detailed homages available, from colleagues and critics around the world. But that visit from 1996 still echoes in my memory. After I enjoyed a brilliantly simple meal of truffle soup, filet of sole and roast chicken, Bocuse sat down at the table. He was wearing the tallest toque I've ever seen on a chef. In one hand, he held a black truffle the size of a baseball. In the other, an Opinel pocket knife, the brand favored by farmers and hunters. He cut thick slices of the raw truffle, dipped them in coarse salt, and munched on them like celery. "I like them best this way," Bocuse averred. Despite his menu's luxury ingredients and complex preparations, he preferred simple things. "French cuisine lost its way," he complained. "For a while, you couldn't even identify what was on your plate! Now we're returning to the basics." 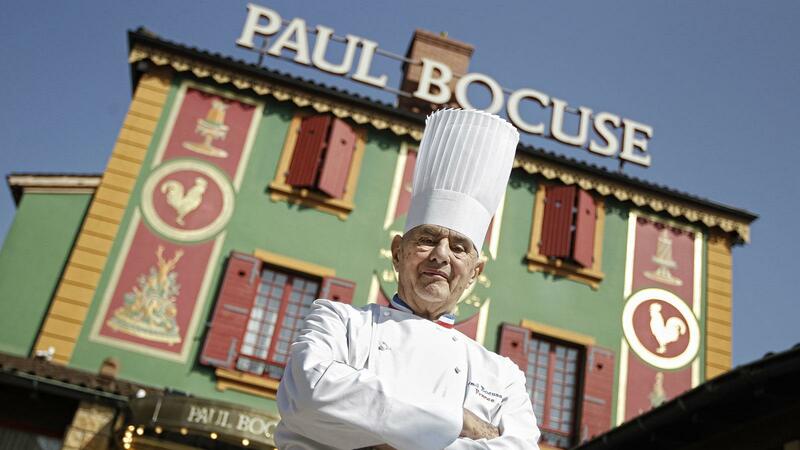 Bocuse believed in local products, traditional recipes and the glory of France. He kept his prices lower than those of most of his colleagues, especially for wine. ("I don't have to charge any more, because most of this is already paid off," he half-joked.) For all of his global fame (and restaurants that stretched from the U.S. to Japan), he was happiest at home, just outside Lyon, where his family had been innkeepers and cooks for seven generations. Bocuse was nearly 70 at the time of my visit, and despite his bravado, his eyes seemed sad. I asked about the future of his restaurant, and whether his son Jérôme would one day take over. The "Lion of Lyon" looked around the room, filled with happy customers and bustling staff. "I don't know if it's such a great present," he said. Whether or not Restaurant Paul Bocuse would be a welcome gift to his son (as of this writing, the succession is still unclear), it was an immense gift to those who were fortunate enough to experience a meal there. I never went back for another visit. But I'm happy I still have the tie. Getting to this post late, but glad I'm there now. Refreshing take on the passing of this singular chef...not that I ever had the chance to be a diner chez Bocuse.